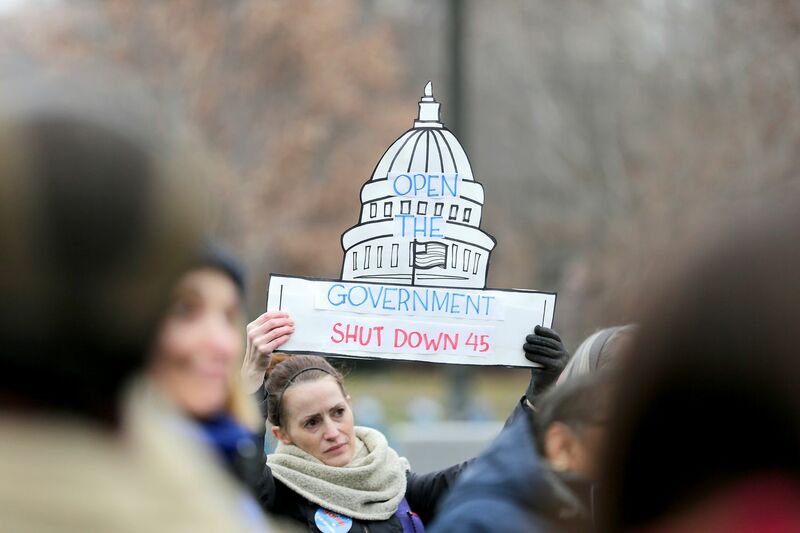 Jenn Hallam, of Upper Darby, PA, holds a sign as federal workers rally to protest the government shutdown in People's Plaza in Philadelphia, PA on January 8, 2019. Hallam said a family member works for the EPA and was there for support. Applications for unemployment benefits in Pennsylvania were up nearly 850 percent in the last week of December compared with the same week the year before, thanks to a surge in requests from workers as a result of the partial federal government shutdown, state officials said Tuesday. In addition to government employees, the shutdown is driving those who work for federal contractors, whom the government won’t reimburse, to seek unemployment benefits, Pennsylvania Auditor General Eugene DePasquale said. Across the country, roughly four million people work on a contract basis for the federal government, "many in low-wage or part-time jobs,” DePasquale said. “While I’m glad the state is ready to assist, the unemployment compensation system was not designed to handle what has turned into a hostage situation," he said in a statement. Furloughed federal employees who are not getting paychecks and are not reporting to work may be eligible for unemployment benefits. But those who are required to work but are not getting paid are not eligible for benefits, according to the Pennsylvania Department of Labor and Industry. Federal employees who do eventually receive back pay must repay any unemployment benefits they receive. DePasquale joined state and local officials and federal workers across the region in calling for the end of the shutdown.